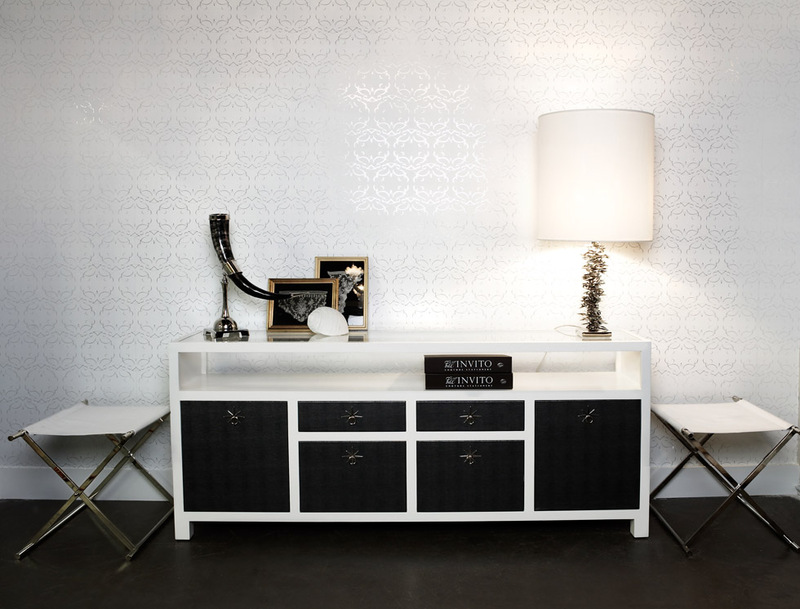 There is no color combination so foolproof as classic black and white. I really don't know whether it can be done wrong — and that's saying something! 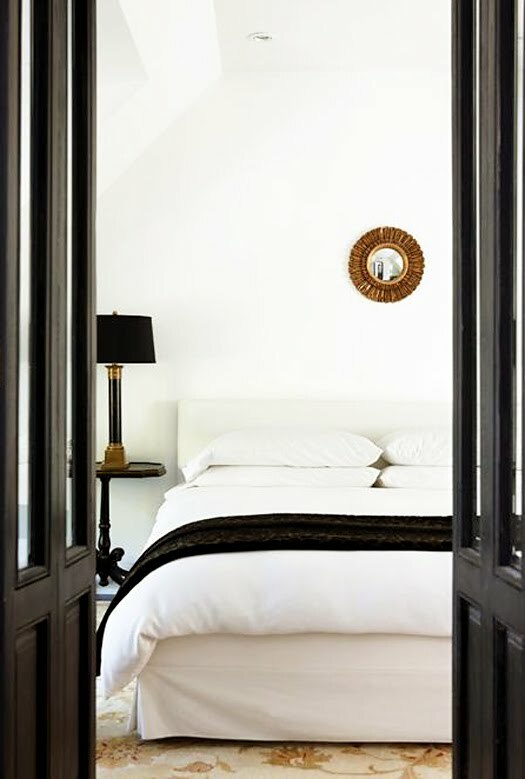 Black doors are the perfect complement to a white palette with gold accents. I wouldn't mind returning home to this apartment foyer with its painted brick and whitewashed floors. 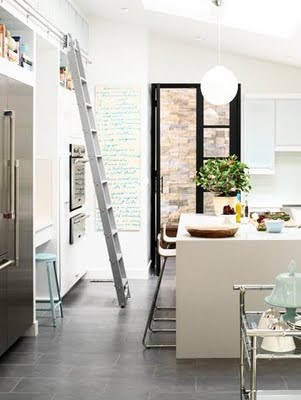 Don't you love the edge that black trim lends to this otherwise monochromatic kitchen? A little gloss never hurts either! I love the overgrown bouquet and stacks of books in this simple but chic space. Renters and commitment-phobes need not worry — just a dash of black paint transforms a clean-lined credenza into a graphic masterpiece. Even a pair of throw pillows will do the trick! I love these, these, and these from new sponsor Fabricadabra. 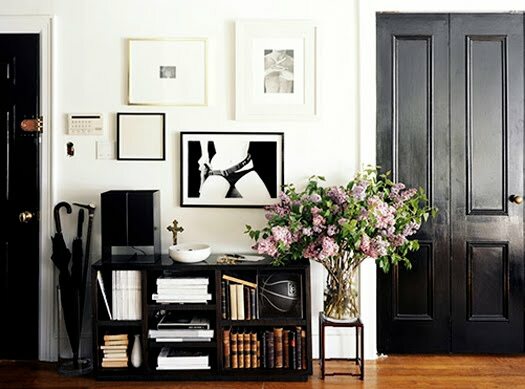 How do you use black and white in your home? It might just be my new go-to! you nailed, those rooms are super gorgeous - great inspiration for em since I actually now realize I do not have anything black at my apt! love this combo. most definitely my fave. You are so bang on, M! It's one of my fave colour cocktails for weathering changes in fashion, seasons and trends! Good for people like me that need EASY! Love all the rooms, but ADORE the mirror with the horizontal type turned vertical. Genius! I think these are beautiful black and white rooms! Also, love the writing on the mirror - would be really cute in a kids room too! black + white always looks good. liking the new updates to the blog! The ladder is so great in the kitchen! I agree...black and white is timeless, classic, elegant and modern! I love black & white, it's such a timeless combo... It's very easy to pull off and always looks expensive. My previous kitchen was b&w, and so was the color theme for my son's birthday party last year. but i don't know that i could pull off all that white, my clumsy self would spill something.. Very good! I'm also digging the newest incarnation of your blog. Loving the new look of your blog! I totally agree, black + white is a timeless, classic combo. love it. Love black & white. Use it lots. Hope you are well. I just look forward to reading this gem every day. Thank you!! So fun, such a treat. I never get tired of black and white spaces! Lovely! You might have this sort of great site here, I am very pleased to read your entire information as Phentermine well as reveal this remark together with you. Copyright Mackenzie Horan/Design Darling LLC 2009-2012. Design by Hanna Seabrook of Gadabout.